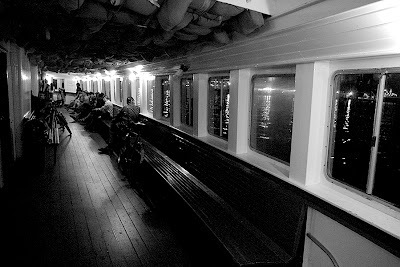 From a distance, the Night Ferry skims silently across inky black waters. Below its decks, ancient marine engines thrum incessantly: their relentless vibration permeates every corner of the vessel and into the consciousness of every passenger, every crewman, every officer aboard. All are more-than-aware of their point of departure; none can possibly know what awaits them at journey's end. Or, maybe it's just the Ward Island ferry, on it's semi-hourly 15 minute ride back into Toronto, bringing weary day-visitors back home from Toronto's Islands at the end of a long weekend. But that's not so mysterious or romantic, is it? One thing I noticed about this photo is that there's a timeless quality to it. There are no visual cues that put it in any particular time-frame: it could have been taken now, in the forties, even the thirties or earlier. Actually, that's not entirely true. I've spotted two things that make this obviously comtemporary: can you spot them? One of them in particular is fairly subtle, but it's there, and of course, there could be more. Feel free to point them out. We can make this a fun game! Or not. Perhaps you'd prefer to just enjoy the photo (which I hope you do in any event). If this was taken in Toronto in the thirties or forties people would be waving Union Jacks and singing God Save the King (or Queen or whatever). And isn't that Waldo sitting on the bench in the foreground. He wasn't around then, was he? The bike on the left of the photo has a suspension fork, which werefairly uncommon in the thirties and forties. Clothing, skyline, cel-phone, bicycle, etc. Is that guy taking a picture of you taking his picture?